ETNA Digital Advisor is a white label online platform for digital advisors, robo-advisory firms, fund managers, RIAs and alternative investment firms. 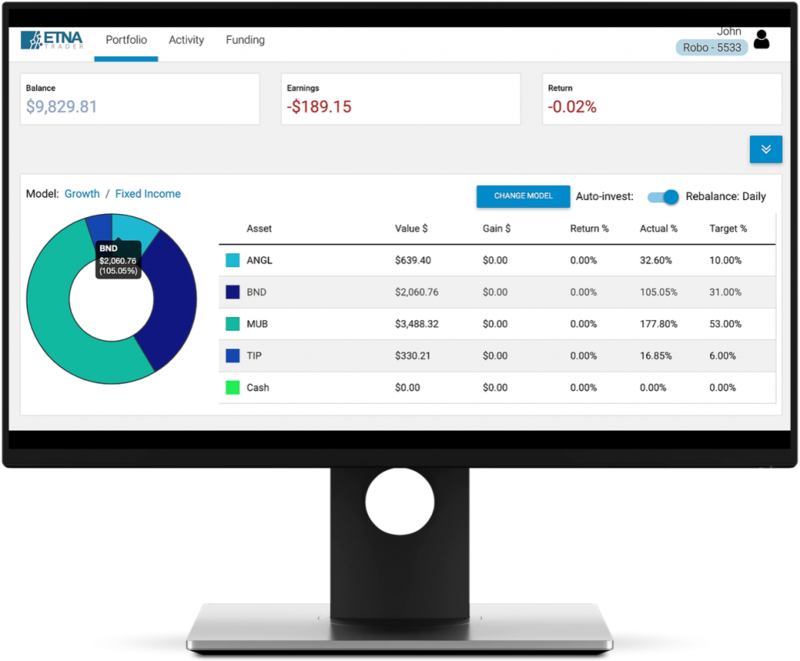 ETNA's white label digital advisor platform was created to facilitate traditional financial advisors, wealth managers and RIAs seamlessly transition to offering digital advice. Introduce goal-based investments and digital advice to your clientele with ETNA Digital Advisor. Focus on unique investing algorithms, user experience, exceptional customer service instead of developing trading infrastructure. ETNA Digital Advisor Platform enables easy online access to customer dashboards, digital user onboarding, risk profiling, portfolio rebalancing and compliance reporting. Our advanced back office portal with OMS automates execution, pre- and post-trade risk management, compliance and reporting. Why ETNA Digital Advisor Platform? 100% rebrandable platform to reflect your brand. Just add your logo, choose a preferred custodian, and you are up and running within days. Use one of preset color themes or create your own, add new languages or implement your most creative ideas with the help of our professional development team. In a world of digital transformation solid technology plays a great role. We transferred our knowledge of many years to ETNA Digital Advisor, so that you can leverage ETNA's FinTech expertise. Focus on client acquisition and creating unique digital advice offering while, ETNA delivers an all-inclusive technology to run a digital advice firm. Our unique pricing models scale with your business. Ideal plan for startups to launch and prove the concept fast and on a budget. Clients's success equals our success, so we grow together with our clients. We offer all-inclusive pay-per-use pricing with monthly license payments. Achieve better transparency and communication with your clients by providing an interactive visualization of their portfolio: interactive graphs, charts and reports give a full picture of the current portfolio status and previous performance of a digital advisor. Clients can fund their accounts, create new investment goals, update personal information and change investment models depending on system's settings. 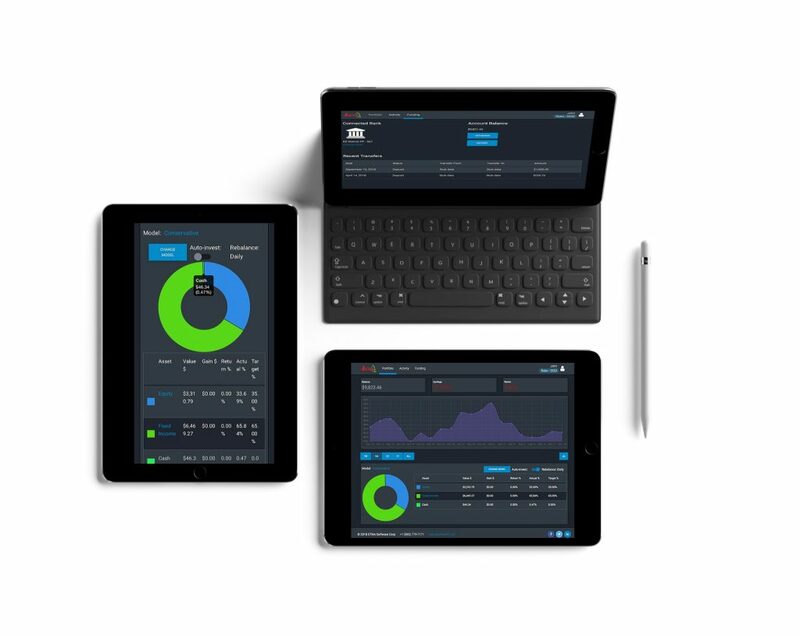 Monitor assets under management (AUM) in real time, portfolio performance and clients activity. Effortlessly communicate and track records for your clientele. Create customizable investment models, manage customer risk profiling questionnaires, settings, digital clients onboarding and funding process. Set up and get automatic reports to have a better control of your portfolio and react faster to market changes. All of these and more from a desktop, laptop or a mobile device. Access your digital advisor from anywhere in the world online. Based on HTML5 technology the responsive design of ETNA Digital Advisor runs within any web browser - mobile or desktop. Unique web application eases up the maintenance of the platform, speeds up the delivery of new functionality and releases, creates smooth and consisting user experience across all platforms and devices. Ready to find out more about ETNA Digital Advisor Platform? Focus on enhancing your product offering, optimizing your unique algorithms or improving user experience or customer service. There are only so many ways a programmer could design a trade order management software or a broker back office. Most of the functionality is dictated by industry regulators, laws and 3rd party partners, such as execution and clearing firms. So why reinvent the wheel when you can focus on innovation instead? Too many companies fall in the trap of re-creating or custom build the software from scratch instead of realigning pre-existing solutions to propel business forward faster. Streamline core operations by leveraging ETNA Digital Advisor Platform. Focus on what really matters - growth and time to market. ETNA has been building enterprise-level trading platforms for more than a decade, long before the term FinTech or WealthTech appeared. Through these years a tremendous expertise and a library of components have been accumulated. Today our clients can leverage in this legacy to get a cutting edge in a fast-paced world of digital transformation. We can build FinTech applications faster and better. In the technical realm, having a helpful expert by your side is an invaluable resource. ETNA provides strategic technical advisory along with modern trading software products. All of our APIs are documented with code examples and SDK available upon request. Our technical support team is ready to answer questions or help with implementation.